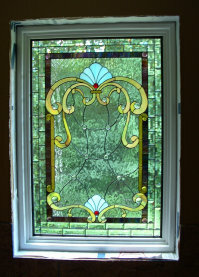 With 62 clear beveled pieces and 25 jewels, this window should be spectacular in the sun. 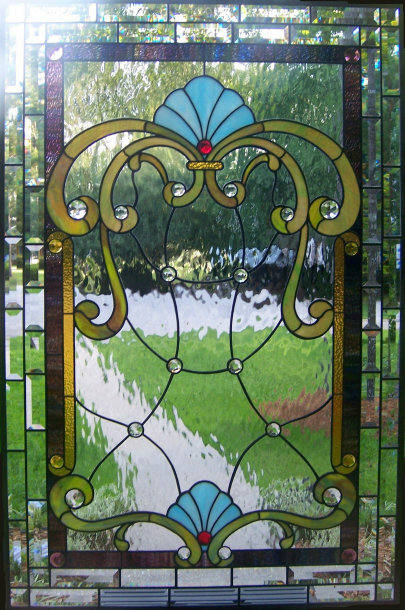 The beveled double border should create rainbows everywhere and the jewels should glow. The clear waterglass background should shimmer like water in the sunlight. Our inspiration for Mona's Window was the magnificient American Victorian window to the right. I spotted this window offered for sale in a catalog for The Golden Movement Architectural Antique Auction held in San Francisco in 1980. 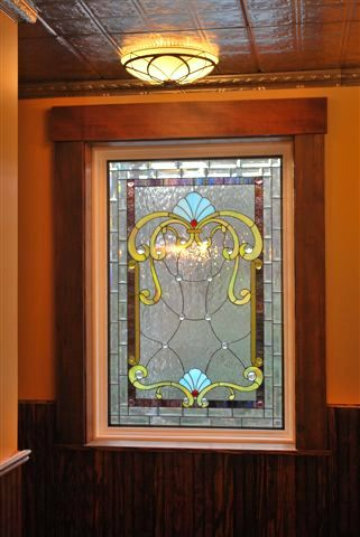 The original window was 3'8" x 8'1" and was probably a landing window in a grand Victorian home. 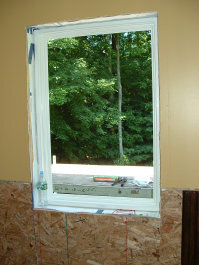 Mona contacted me about building a Victorian style bathroom window for her home in Hudson, New Hampshire. She and her husband were completely remodeling an upstairs bath and wanted a window that would sparkle in the sun and let in maximum light. 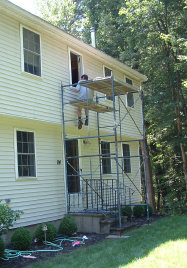 Mona's Husband at work installing the outside window. Certainly not a job for amateurs! Mona's Window measured about 29" x 44", contained 197 pieces of glass and was completed in July 2008. 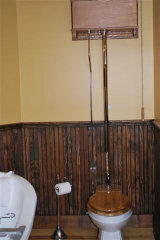 Look at the marvelous antique fixtures, wood walls, tin ceiling and wood floors. 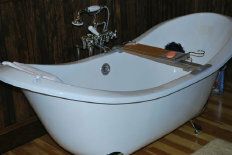 Mona & her husband have certainly created a beautiful and unique period bathroom. 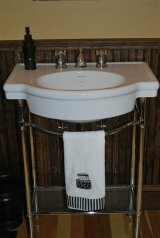 What a magnificient bathroom ! Mona was nice enough to send some before and after photos of her window.